After Day 1C of the 2018 World Series of Poker Main Event, which started players with 50,000, former champ Joe Cada bagged up just 16,500. He was near the bottom of the counts. Obviously, you can call it a comeback as he now finds himself at the final table. "It was a lot more of a grind this time," Cada told PokerNews. "I knew that it was a long eight days and I felt like I had room to come back. I had 9K at one point in this tournament and I just grinded a short stack. I was like maybe one-fifth of average almost the entire tournament. I just had to pick my spots and try to shove on people that were raising too much and just try to pick up some hands." It marks the second time he’s been in this spot as nine years ago, he topped a field of 6,494 players to win the 2009 WSOP Main Event for $8,547,044. At the time, he was 21 years and 11 months old, and became the youngest player in WSOP history to win the Main Event. 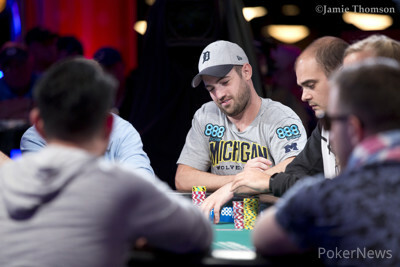 Not only that, he did it by besting a final table that included Phil Ivey, Jeff Shulman, and Darvin Moon. "It feels unreal. What other feelings are there?" Cada said after returning to the final table. "We'll see how it turns out. I don't know...cards...you never know." An online poker player before striking it big, Cada, born November 18, 1987, still resides in Shelby Charter Township, Michigan. He made headlines earlier this summer for two reasons. 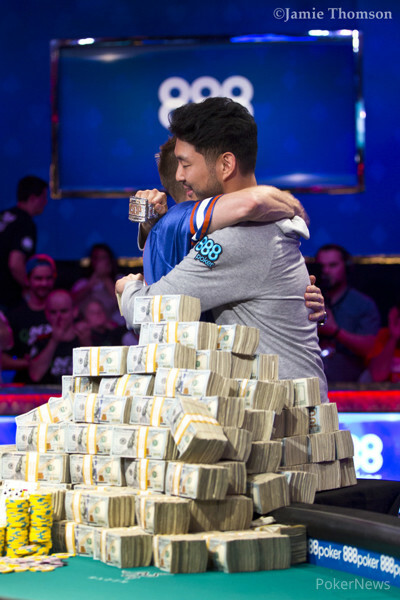 First, he bested a 363-player field to win the 2018 WSOP Event #3: $3,000 NLHE Shootout for $226,218 and his third bracelet. His other gold hardware came back in 2014 when he took down Event #32: $10,000 NLHE 6-Handed Championship for $670,041. The other headline he grabbed was around Father’s Day, which is when he put his father, Jerry Cada, into the $1,000 Super Seniors Championship. The story was heartwarming as not long before Jerry spent over a month in a coma after suffering a stroke. During his recovery, Joe spent time teaching his dad the poker ropes. Joe was on his dad’s rail, but now it’s time for the father to root on son once again. As for playing it out in the coming days as opposed to the defunct November Nine break, Cada's all about it. "I like it better. I'd rather just get this thing over with and see where it lies. The three months...you toss and turn a lot thinking about where it's going to end." One of Cada’s pivotal hands came with 15 players remaining in Level 34 (200,000/400,000/50,000) when he three-bet jammed for 6.875 million holding ace-six suited. The initial raiser, Frederik Jensen, called with ace-ten and Cada was in trouble. Fortunately for him, the board ran out with three hearts, including one on the river, to give him new life. Cada on the hand: "I don't know if I would have been as patient back then. I was a little bit more patient this year. I mean I got lucky with that ace-six of hearts but honestly, if I didn't ship that, for the next two hours, I wouldn't have won a hand. I would have just been blinded out. He actually made a really good call with ace-ten. That's a tough spot there. I got lucky with that and I was able to get in some really good situations where I was able to run my stack up." In another big hand, Cada executed a three-barrel bluff against Alex Lynskey, who had flopped top pair on a king-high board. Cada’s river shove sent his Australian foe into the tank and eventually, he folded. Cada’s brazen bluff lit up the Twitterverse and showed that he was willing to put it all on the line for another shot at the title. "It was just situational. I was lucky enough for a jack or a queen to come off because that was the only way I was going to continue with the bluff," Cada said of the hand. "That board's my range. They're playing tight and I'm raising into the two chip leaders. There's no reason why I can't have a straight or two pair there. It's so hard to have any bluffs besides an ace, which I did but it's not often. It's just situational." If Cada were to win the Main Event, he would join the ranks of Johnny Moss, Doyle Brunson, Johnny Chan, and Stu Ungar as repeat winners. Similarly, a fourth bracelet would put him in a company that includes Michael “The Grinder” Mizrachi, Brian Rast, and Amarillo Slim, just to name a few. Finally, Cada is the first Main Event champ to return to the final table since 1995 winner Dan Harrington went back-to-back in 2003-04. Cada has a favorable position at the table. The two big stacks are to his right, and the two short stacks are to his direct left. Cada has the experience and knows how to close the Main Event out, which just might be the edge he needs to make poker history.